The last day of the CNY celebrations will be tomorrow, after which it's back to serious stuff like work and school. And blogging. Our relatives and friends who came home for CNY have all gone back. There's been so many eating feasts that my tongue hurts. To give my mouth and stomach a rest, I've been eating congee (rice porridge) in between the feasts. It feels so good to eat light after all those rich carnivorous CNY dishes. Last week, I did two dinners and one lunch consecutively in two days, stressing myself because I didn't get into the kitchen until mid-afternoon. I make the same two resolutions regarding punctuality and non-procrastination every year. Since everybody's sick of rich dishes, I chose some lighter dishes and cut back on the portion of each dish. Instead of serving the dishes buffet table style, I seated the guests at two tables. This one's in my back patio where it's casual but cooler. Nice hand. I wonder who the owner is. One of the dinners was for my ex-colleague and friend K and her American husband, and other colleagues whom I worked with in the same department. We practically grew up together, having joined the bank when we were fresh wide-eyed young graduates, going from being courted to getting married, having babies and now having children who are working or in uni. It is strange how we still feel the same, after all these years. I treasure these old girls. 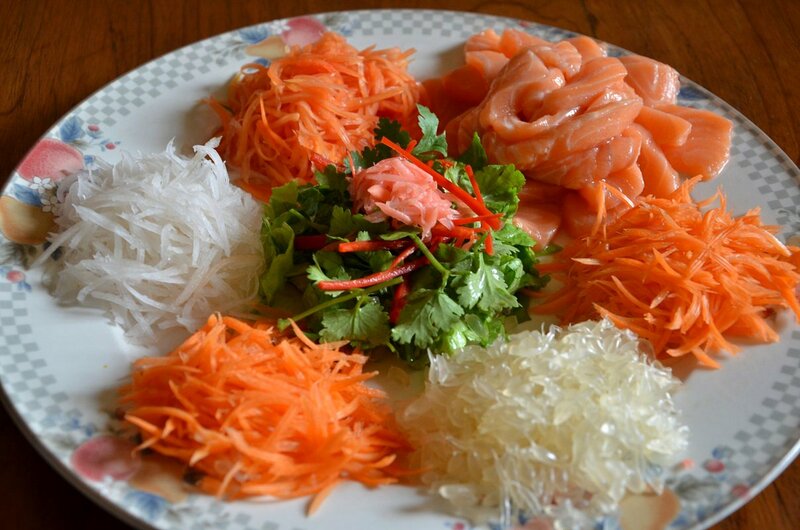 I simplified my yee sang this year, using whatever I had in my kitchen. The pickled half-ripened papaya was from my garden. The yee sang was rather bland and the reason suddenly occurred to me when I was in bed that night: I didn't bother to buy apricot jam, had reduced the salt and totally forgotten to add peanut butter and toasted peanuts because I couldn't find them when I was making the dressing. Yes, WH was right. I need a better, more organized kitchen. 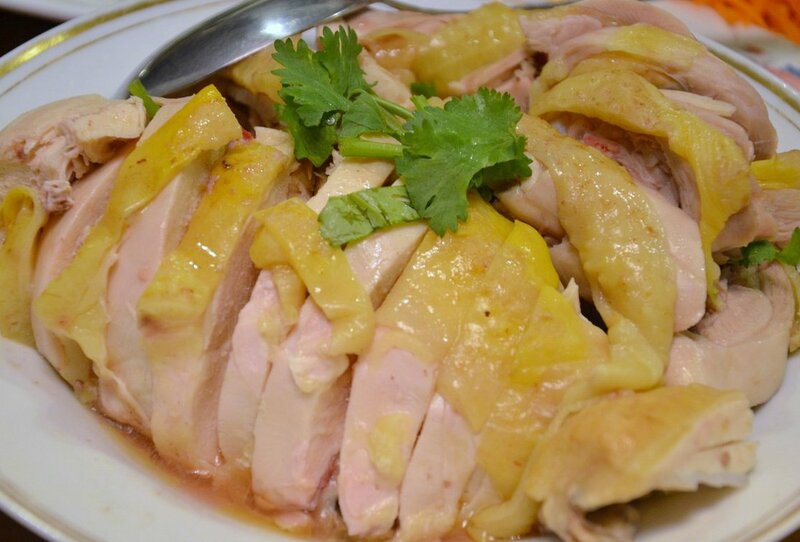 When chicken is free-range, the best way to cook it is to just boil it in low, gently bubbling water. I saved the hassle of making the traditional dip of ginger and spring onions and instead mixed sesame oil, light soy sauce and some of the stock from boiling the chicken and poured that over the chopped chicken. 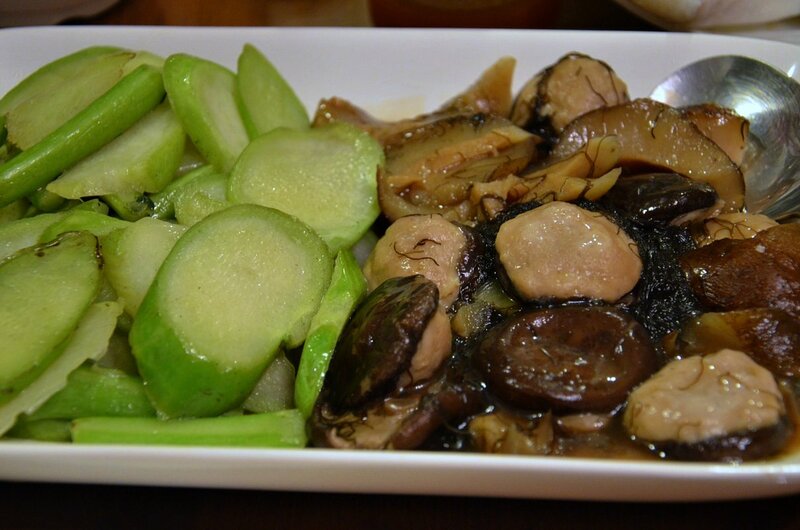 Stir-fried kailan stems with stewed stuffed mushrooms (recipe one day soon), sea cucumber and black moss fa cai. 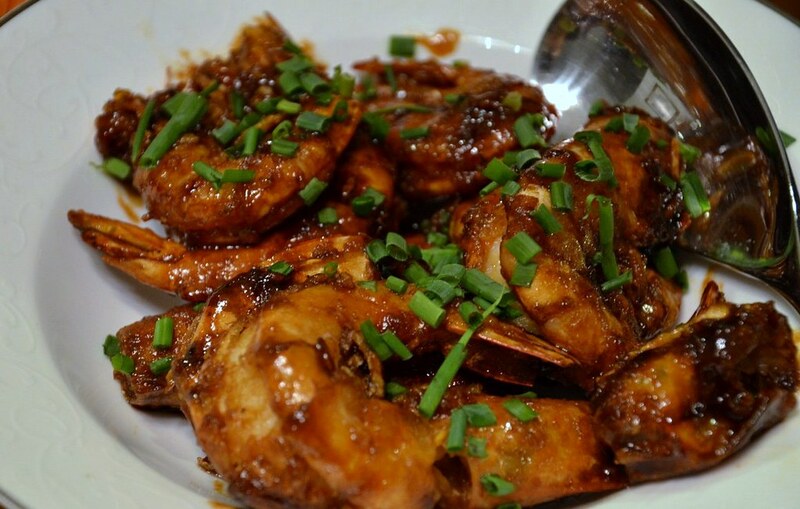 One of my no-fail dishes, marmite prawns. 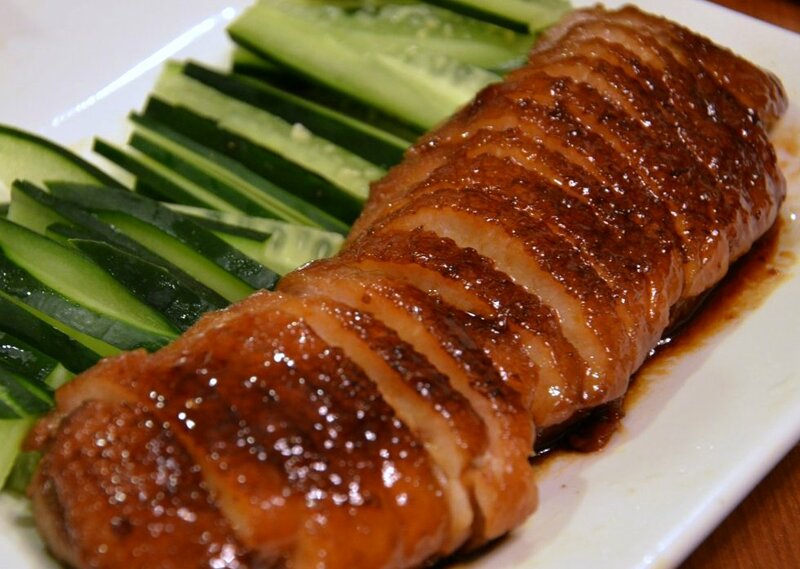 This ginger soy sauce duck was the hit of the night, which was surprising because it was so easy to cook and I didn't even taste it when cooking it. I decided to use duck breasts instead of a whole duck because the breasts are the meatiest part of a duck and so much easier to cook than a whole duck. Recipe to follow. 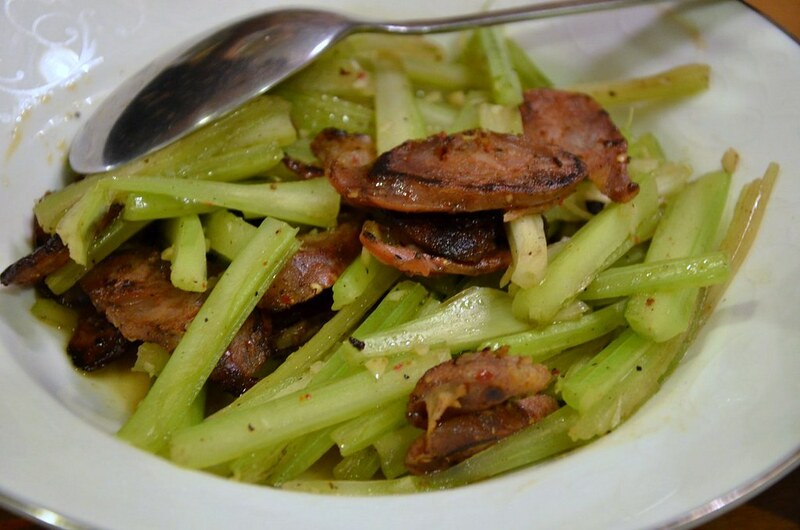 Home-made Sichuan sausages stir-fried with celery. 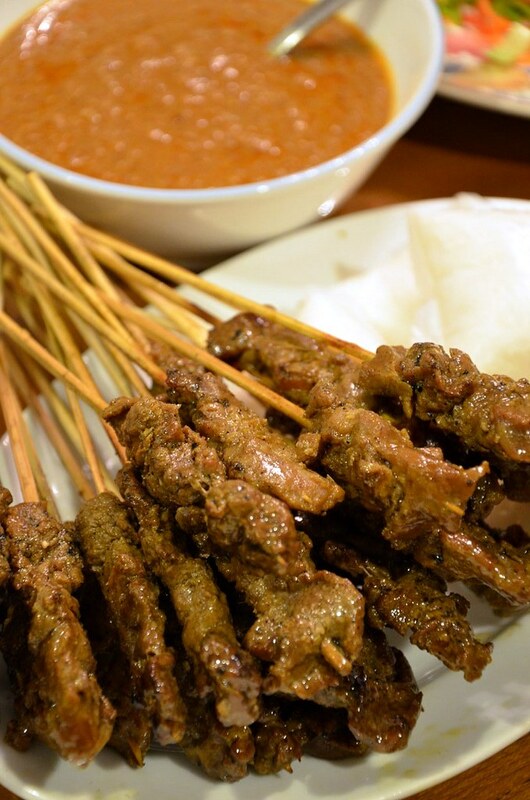 Beef satay with blocks of compressed rice from a satay stall near my house. I made Khong Aunty's fa cai soup too. It's one of my fave CNY dishes and I was told that it was good (I was too bloated to eat any). 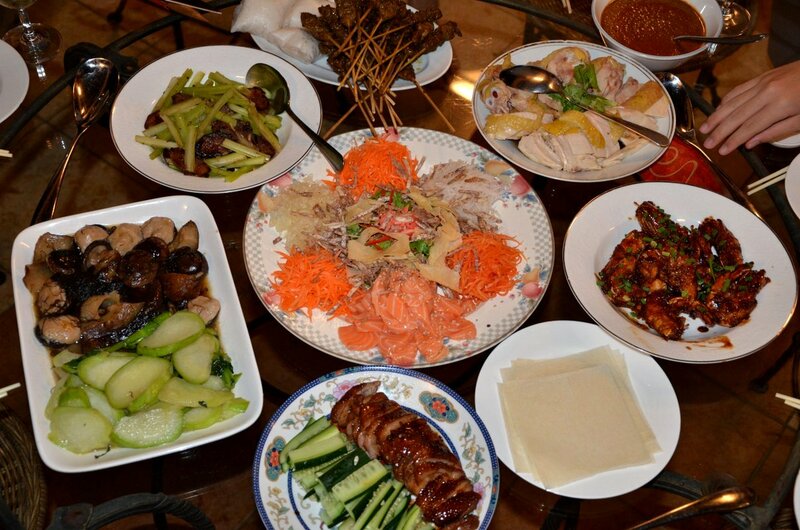 There were 10 ingredients in the soup: pork bones, dried oysters, dried scallops, water chestnuts, chestnuts, fa cai, gingko nuts, dried Chinese mushrooms, beancurd sticks and red dates. They're in season and the price has gone down so right after dinner we stuffed our faces with durians. 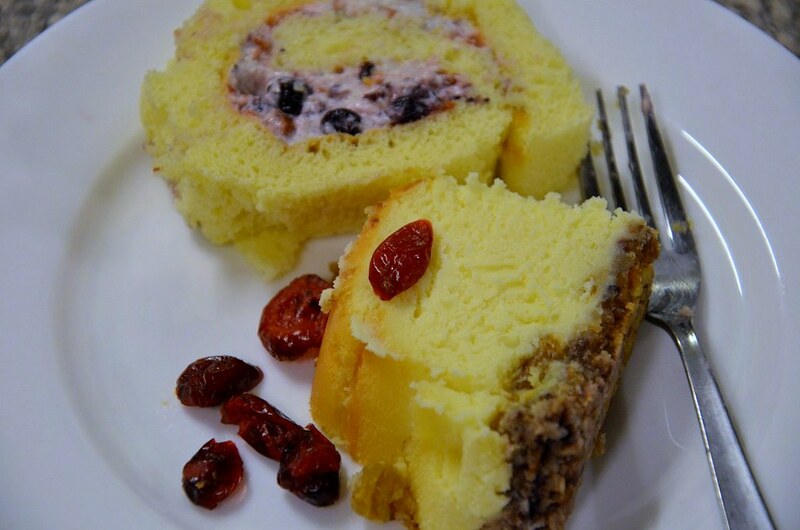 Dessert was my sakura swiss roll (a bit of a flop here because I lined the baking tray with ordinary baking paper, not greased proof paper, and the cake stuck to the paper) and a great Junior's New York Cheesecake. After everyone had left, I found that I had forgotten to serve my home-made prawn crackers. K and D will have to come back again next year. Terri, everything looks so good! Terri, thank you for a very good meal, better than in a restaurant, and a good time with "old" friends! 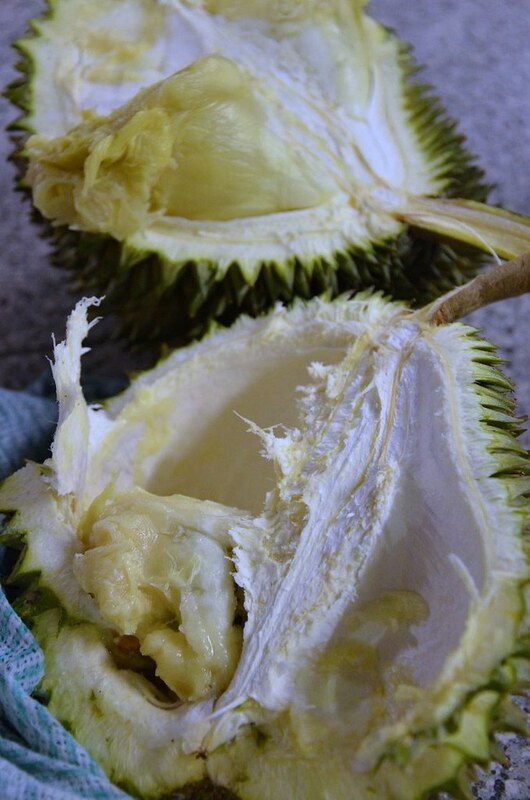 And, very thoughtful of you to include durian as a dessert too! My last fresh one for a very long... time! Oh my God, I wish I was at your house for that dinner. It all looks so delish! tina; when are you n pat coming for dinner?! k n d: are u back in O--o already? yes, i had a great time too. u guys must come back every year! nate: :) hey update your blog lah!